Kasper Sofa Renew your love of blue with the casually cool and contemporary Kasper sofa. Its textured indigo polyester upholstery is a welcome sighting. Track arms and a 2-over-2 cushion design enhance a clean, crisp aesthetic that simply works and looks stunning in your living room. Renew your love of blue with the casually cool and contemporary Kasper sofa. Its textured indigo polyester upholstery is a welcome sighting. Track arms and a 2-over-2 cushion design enhance a clean, crisp aesthetic that simply works and looks stunning in your living room. My children love the cushiony and comfy feeling. Far cry from my old couch from a local wholesale retailer, noisy, squeaky and shaky at five months. I love this couch is very comfortable and was a very reasonable price! I’m very happy with my purchase! Loved the look and feel of the couch so much that I got a loveseat, a chair, and 3 tables to match. Now just looking to buy a TV stand! We found the size 74.5 perfect fit have found it firm yet comfortable. We felt we got a good deal and have been happy with product. Found other items we are interested in and will return. The sofa and love seat set are both amazing. Very comfortable! Had them for 4 days now and already fell asleep on the sofa three times. They are both light weight which I love because I rearrange my living room set often. Even though they are light weight, they are still sturdy. the material is comfortable as well. I would recommend to any one! We were looking for a couch that could fit our space while not sacrificing comfort, durability, style and affordability. This couch meets all of that! We also bought the matching ottoman so we can make it like a sofa chaise or have an extra seat for guests. It's getting comfier each day too! I just purchased this sofa this week and it fit well and looks great! Looks well made I’m hoping it will last long! Wicked comfy and perfect size! Cushions seem larger at home than I remember at the store. So comfortable! I love this sofa. Its very cushiony and comfy. The only minus for me is that you can not take it part, if you decide to move. But other than that, its great. Definitely recommend! It is good and comfortable. If the back cushions is detached it is better. It matches with my living room. Looking really good! Very satisfied!! I am very happy with this sofa. It is the right size for my space and a good value for the price. The blue/gray fabric is very elegant and seems durable. The pillows are the right mixture of firm but plush. The construction quality is good, considering the price. Perfect for a dorm/studio/first apartment. Can this be purchased as a sleeper sofa? BEST ANSWER: Hello Andrew, thank you for your interest in the Kasper collection! We do offer a sofa with a full sleeper. You may search by SKU# 260473017 Kasper Full Sleeper Sofa to order. Nope, not a sleeper sofa. Whats the weight limit of this sofa? BEST ANSWER: Ashley Furniture does not provide weight capacities. We generally recommend no more than 250 lbs. per seat. how wide does the door need to be for this couch? 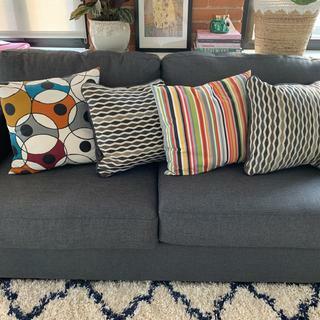 Are cushions reversible and are back cushions lose or attached? BEST ANSWER: The cushions on the Kasper Sofa are not reversible and have attached back cushions.